6th Group Stage match of CLT20 2014 was played between Cape Cobras and Hobart Hurricanes at Rajiv Gandhi International Stadium, Uppal, Hyderabad. 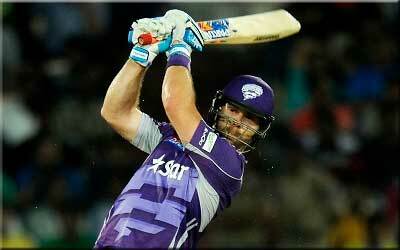 Hobart Huricanes with superb batting performances of BR Dunk (54) and AC Blizzard 78* won the match by 6 wickets. AC Blizzard declared man of the match for his match winning inning 78* runs of 48 balls. Earlier Cobras won the toss and decided to bat first. Cobras lost HM Amla early but, other top order and middle order batsmen played good cricket and pur huge score of 184 runs at the end of 20 overs. RE Levi 42 runs and VD Philander 32 of 14 balls were top scorer for Cobras. Following huge target fo 185 runs, Hurricanes started confidently and top order batsmen BR Dunk and AC Blizzard played superb innings for Hurricanes. BR Dunk contributed very well 54 runs of 35 balls and AC Blizzard remained not out till end and made quick 78 runs of 48 balls. Hurrucanes registered comprehensive win over Corbars by 6 wickets when 6 balls remaining. AC Blizzard declared man of the match for his match winning inning of 78* runs of 48 balls.